If anyone can shed light on this weird story, do please let us know. There have been a few news items recently (here in pay-to-read HS) about a spat in the City Council over parking spaces. Representatives of Kokoomus (whose supporters generally like big cars) are unhappy that representatives of the Greens (whose supporters profess to dislike all cars) appear to be gaining unfair advantage in Jätkäsaari. Bizarrely enough, we know now what cars they all drive (or don’t)! 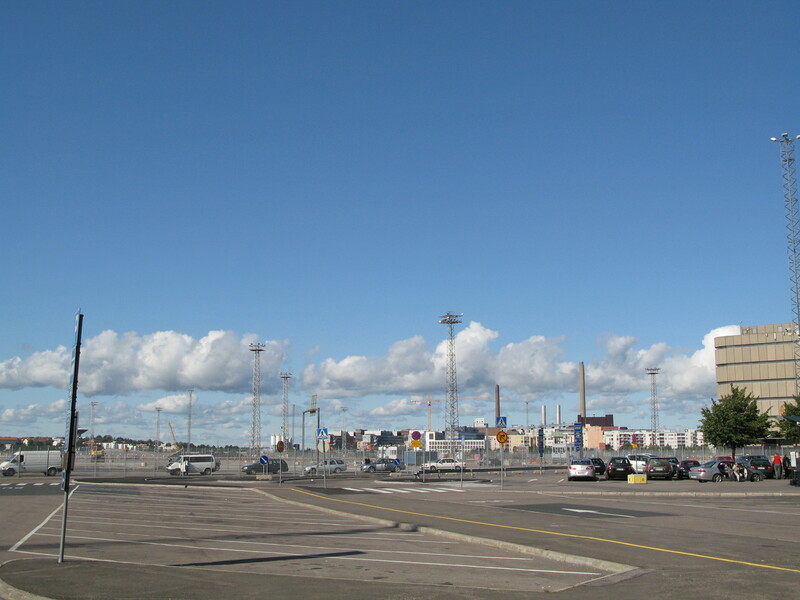 Jätkäsaari is one of New Helsinki’s building sites now. It used to be a place folks went to swim and hang out. Then it became harbour. Then it became container harbour. Then it became a field of concrete before the builders arrived. The principles of the building are community, environmentalism and access. There’ll be twice as many communal spaces as in an ordinary block of flats. Sounds great! And since these people have taken on board the hype about green Jätkäsaari being near public transport links, they feel they can survive with fewer cars. And how this pisses others off!! And the others may yet force the builders to add a million Euro to the budget and remove 22 parking spaces worth of scarce resource to meet Helsinki’s building standards. Legally. What we don’t understand is how this became a party-political thing. Except that, unsurprisingly, some of the folks involved and due to own property here, happen to be Green politicians. Good for them, say we. Besides, we had always thought that parking standards are about reducing car-dependency, as it puts a strain on shared resources. But it seems in Helsinki parking standards don’t set maximums but minimums. The only legal or regulatory info we found was from Finlex, Finnish law. The statutes, from 1958, stipulates that enough (not specified) space must be provided for private vehicles. Parking standards have always been imposed to ensure easy motoring. The concern for the planners in the 1960s, when cars first became commonplace, was to have enough room for them everywhere, since they were the mode of transportation of the bright new future. They didn’t fit in old cities very well, so the traffic and city planning for the future had to make sure that there was parking for them at every new building. The risk was, of course, that if you didn’t enforce a minimum for parking spaces, the constructors might not build them, because they cost money. Personally I think that this is actually one of the things where a completely free market would probably work pretty well. Don’t regulate parking in Jätkäsaari at all, and separate the purchase of a apartment and a parking space completely from each other. See how much the motorists are willing to pay for their parking. Land is not cheap in those parts. Raises more questions, questions… Like, is the use of regulations from the 1960s just a sign of inertia in transport planning or is there a conspiracy? Hmm, who pays the real costs of all the underground parking around here? A lot of it is inertia. The current senior planners and civil servants were trained in a time when mobility by private cars was the number one criterion (whether explicitly stated or not) in any new plan, i.e. enough speed, capacity and parking for cars. I don’t know what is taught in planning school at the moment, but I wouldn’t be surprised if things haven’t changed much. I suspect most of the current people in senior positions own cars and drive them to work. The idea of planning a car-free residential area or planning housing without parking is profoundly foreign to them. The trouble with paying for parking in Helsinki is that the cost of the construction of the parking spaces (the enforced minimum and usually more) in an apartment building is included in the price of the apartments. The residents then get to apply and fight for the parking spots, which don’t cost nearly their actual market price, and because of the seemingly low price, there doesn’t seem to be enough of them. The net effect is that the people who don’t have cars end up subsidizing the parking spaces for those who do. The free-market solution to the problem (and for the record, I’m personally probably closer to the left than the right politically) would be to sell the parking spaces and apartments completely separately from each other and charge what the market will bear for each. Apartments would be cheaper and parking a lot more expensive. Of course, retrofitting parking structures into an existing built area can be difficult, so in a place like Jätkäsaari there should probably be some clever way to prepare for this, especially since underground construction is particularly expensive there. And If the demand for parking turns out to be huge in some place, then I suppose there will be enough rich car owners to pay for underground structures and such. On the other hand, if space reserved for parking buildings is not needed for that purpose, it should be straightforward enough to build housing there instead. Groan … so those of us who don’t drive aren’t just paying for new motorways and such but actually paying a higher cost to live in the city. Where you really can so wonderfully live without a metal cow! Thanks again.